Affordable swaps so you can have a place you’re proud of. Living room inspiration photo found on Western Daughter. It can be tough to design a living room, especially when you don’t have the time or money to do it. 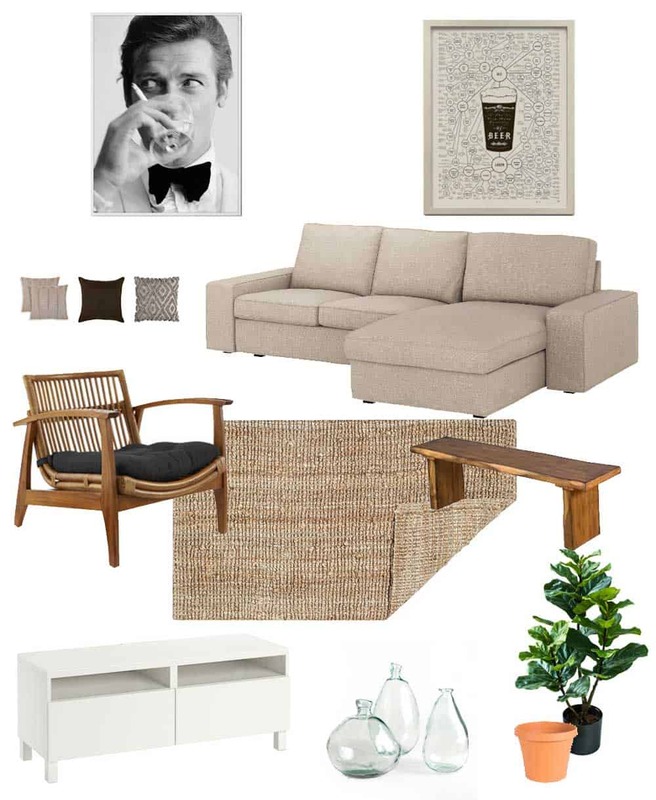 So we’ve taken all the guesswork out of it and created a simple plan for an inviting, comfortable space using elements that won’t break the bank. 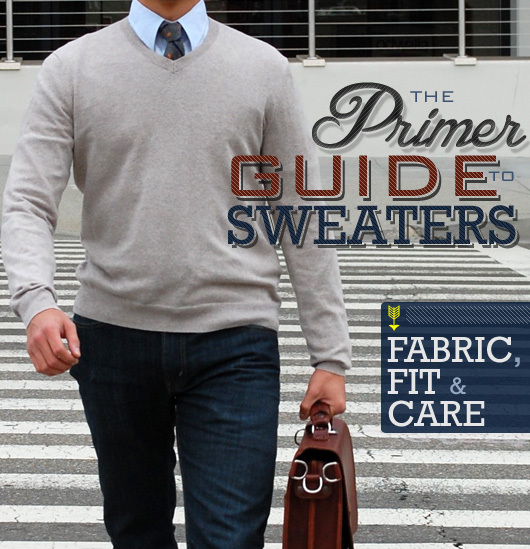 And the color scheme is modern and muted, so you won’t have to worry about coordinating colors. 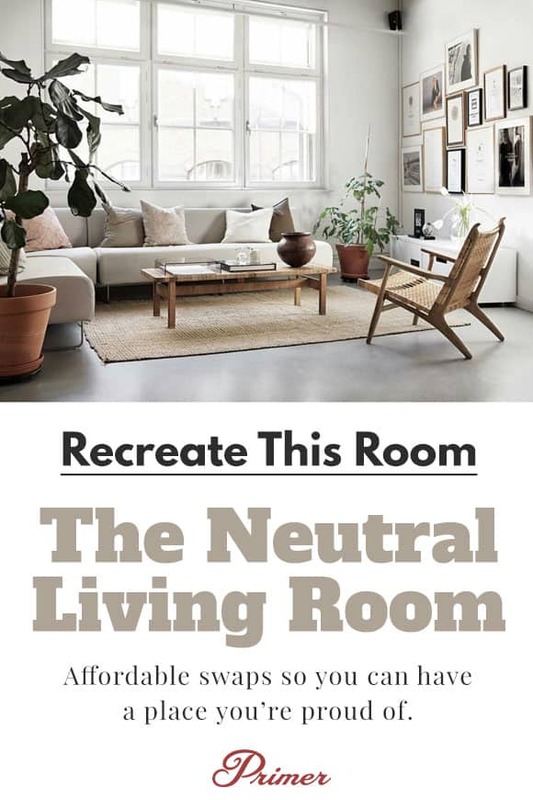 Beige, white and wood will pair perfectly to create an effortlessly stylish room that you’re sure to love. To achieve the modern look of the inspiration living room, start with a modular sectional sofa with clean lines and chunky cushions. 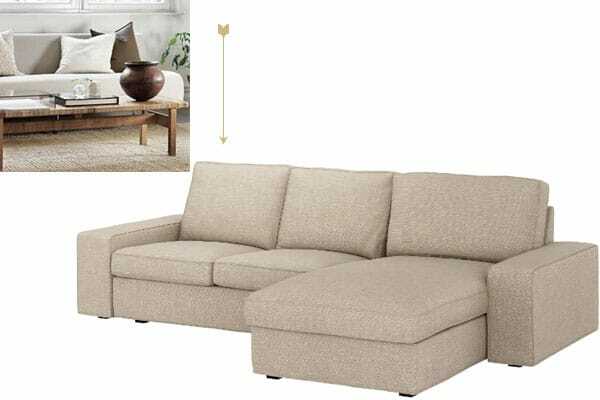 This beige one from IKEA has a thick, block-like silhouette which will be a dream to fall into after a long day at work. Next, you’ll need a statement chair with angular lines. 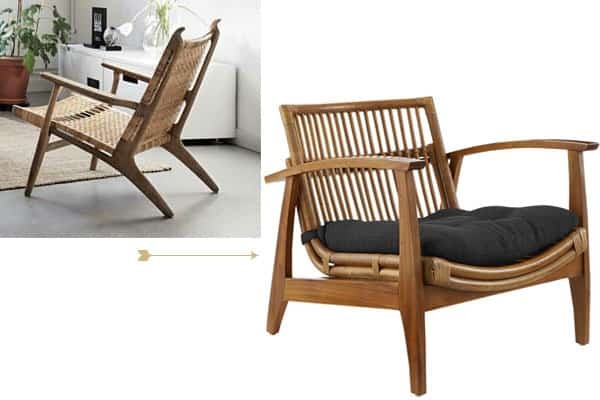 The Noelie Rattan Lounge Chair available at CB2 offers a low, comfortable accent chair that provides both a modern and organic feel to the room. Greenery is an easy way to add life to a space, but for those of us with black thumbs, artificial plants can be a welcome alternative. This faux fiddle leaf fig tree looks quite realistic thanks in part to its metal supported limbs that can be adjusted and customized for your space. 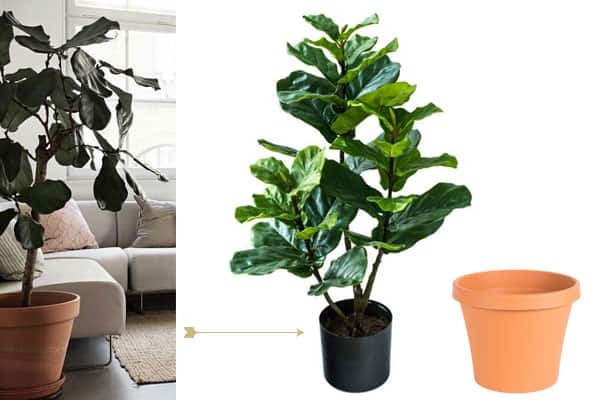 Don’t forget to buy a planter for your new fiddle leaf fig; this terra cotta colored pot will provide a solid base for your plant, and the saturated rust orange color will pair nicely with the green leaves. It has a removable drain plug in case you’d like to use it for a living plant. 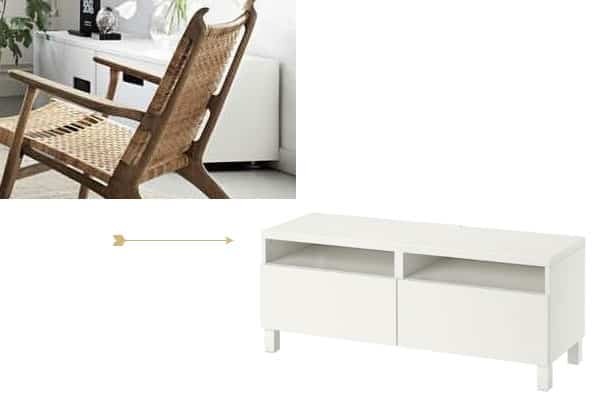 Add a bit of storage to your space with this simple white console cabinet from Ikea. The Besta TV Unit can be used to store anything from magazines to electronics, and the open shelves on top are perfect for displaying coffee table books or small knick knacks. Throw pillows are a great way to get creative in a space without spending a bundle. This textured pillow has a geometric diamond pattern woven onto the surface, making it the perfect complement to some of the other more organic shapes in the inspiration space. Add a touch of faux fur to give your sofa a soft, inviting vibe. 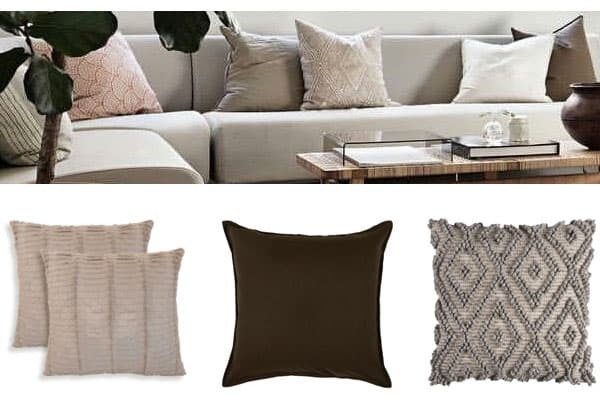 These cozy throw pillows will add a dose of warmth to your modern space, with grid-like rows of faux fur panels that create a subtle texture on the surface. They are filled with polyester for the perfect combination of comfort and support. Add a couple of plain dark brown throw pillows for some contrast to the lighter textured ones. The cover is made from a soft woven cotton material, and the inside is filled with fluffy polyester for long-lasting comfort. Don’t forget to anchor your room with a rug; this tan one from Safavieh is made of thick jute fibers, a sustainable material that is also quite durable. It is reversible and borderless, so you can flip it over once it inevitably gets dirty. Add a bit of handmade charm to your living room with a wooden coffee table created by a skilled Etsy artisan. This wooden bench has various size and color options so it can be customized to fit your space, and the simple shape will pair seamlessly with any style. This decorative round table vase will be the perfect finishing touch to your space. This piece has a fabric-like texture on its surface, and the rounded shape allows it to function as a standalone decorative piece – no flowers necessary. Add some drama to your wall with a large scale black and white photo… simply download it and have it printed at Staples or your local office supply store. Add a basic white frame and hang it on your wall with a cluster of other monochromatic pieces. Show off your love of beer, and learn something while you’re at it! This chart shows the many varieties of beer, organized into different sections in the style of a vintage chart. Grab a print on Etsy and then frame it in a basic black frame. Add a bit of worldly charm to your living room with one of these irregular glass vases made in Spain from recycled glass. Fill one with flowers (try high quality artificial ones… we won’t tell!) or group all three together for a unique decorative statement. What’s the key to assembling all the pieces into one cohesive layout? Layering. 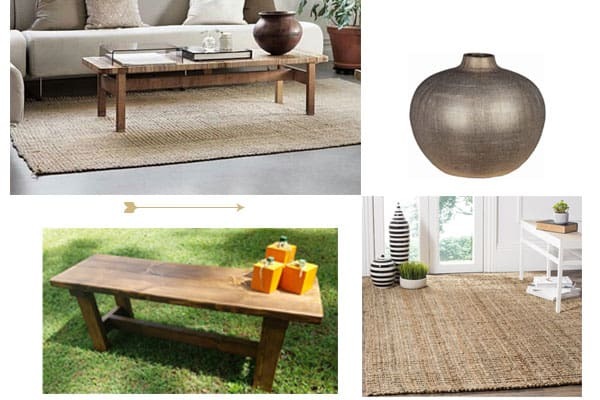 Make sure to get a rug that’s big enough to fill most of the room, and then place all four pieces of furniture on it. Adding the rest of the accents will be easy! Faith Towers is a designer and writer with a passion for all things creative. She received her art degree from Skidmore College, and her work has been featured in many well-known publications such as Forbes, Yahoo and Curbly. 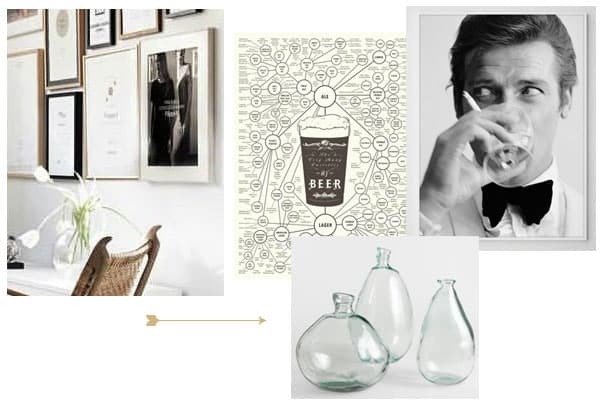 Visit her blog Design Fixation for more creative inspiration. Fall Getup Week: The Patterned T-Shirt + Vote For Your Favorite Getup from This Week! What’s The Difference Between A Trucker Jacket And A Denim Jacket? Though, I have to admit: I love IKEA, but their couches are usually awful; they’re not comfortable and relatively expensive for what you get. I would definitely check out the egan ii couch at Living Spaces (https://www.livingspaces.com/pdp-egan-ii-cement-sofa-wreversible-chaise-214362) for a SUPER comfortable, cheaper alternative (I’m sitting on it right now). 2) A real terra cotta clay pot may be a better choice for with the fake fig tree. Because the tree is fake, you wouldn’t have to worry about water damage. Also, using a clay pot would give the overall setup a more authentic and less plasticky feel. And they are cheap as heck at any home improvement store or garden center. These are great, love that chair! We've been so scared into thinking credit cards are dangerous that we've forgotten what a powerful and integral tool they can be.